BMW launches the all-new BMW X5 at the Singapore Motorshow 2019. Singapore. BMW Asia and Performance Motors Limited today launched the all-new BMW X5 at the Singapore Motorshow 2019. 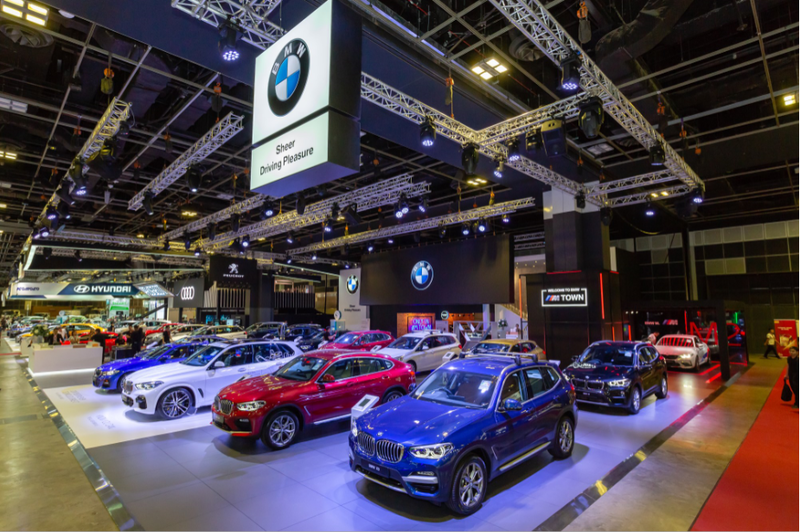 The annual motoring event, held from 10 to 13 January 2019 at Suntec Singapore Convention Centre (Level 4, Booth 121), is also the setting for the ASEAN premiere of the all-new BMW 3 Series. The fourth generation of the BMW X5, the Sports Activity Vehicle that started it all, impresses with its wealth of innovations and represents the most compelling embodiment yet of the familiar Sports Activity Vehicle (SAV) blueprint: the ability to venture off road combined with a talent for dynamic driving pleasure on it. The new exterior design language clearly emphasizes the presence, authority and robustness of the all-new BMW X5. The interior, meanwhile, blends generous levels of space with modern design and a luxurious ambience. Set to be launched here in first half of 2019, the all-new BMW 3 Series exudes dynamic design, agile handling, exceptional efficiency and innovative equipment features, and takes the signature characteristics of a BMW and turns the volume up several notches. The all-new BMW 3 Series is also set to revolutionise driving pleasure as it will be the first BMW model that will come with the new BMW Intelligent Personal Assistant. BMW 3 Series drivers and passengers will be joined by an intelligent, digital character that responds to the prompt “Hey BMW”. The BMW Intelligent Personal Assistant learns routines and habits. It is subsequently able to apply them in the appropriate context, for instance saying “Hey BMW, I’m cold” will prompt the car to adjust the temperature accordingly. From March 2019, the all-new BMW X5 fitted with the BMW Operating System 7.0 will also be able to install the full version of the BMW Intelligent Personal Assistant by Remote Software Upgrade without having to visit a dealer. After the upgrade, BMW X5 owners will increasingly be able to operate their car and access its functions and information simply by speaking. Please refer to the addendum for all the model descriptions. Addendum – BMW Model Descriptions. The new edition of the BMW X5 captures the imagination with clarity of design, comfortable, sporty and authoritative driving attributes and innovative equipment features. Its exterior features powerfully sculpted surfaces, precise lines, large BMW kidney grille with a one-piece surround and three-dimensional form rear lights, while its interior exudes a classy and modern aura thanks to sophisticated materials, harmonious design and an innovative control concept. The all-new BMW X5 hosts the debut of the BMW LiveCockpit Professional which allows the display and control system to be geared even more precisely to individual driver needs. Also available is a two-axle air suspension system with an automatic self-levelling function – this provides excellent ride comfort in all driving conditions. The all-new BMW X5 also features the latest generation of BMW xDrive, which is now able to split drive torque between the front and rear wheels even more efficiently as the situation demands, to maximise traction, agility and directional stability. This latest edition of the BMW 3 Series Sedan sees BMW continuing to build the sporting tradition of the 3 Series. To create a modern interpretation of sporting aesthetic, the exterior design of the all-new BMW 3 Series Sedan uses a combination of precisely drawn lines, strikingly contoured surfaces and a wide, low-slung front. Making its debut in the all-new BMW 3 Series is the BMW Intelligent Personal Assistant, an intelligent, digital character that responds to the prompt “Hey BMW”. The BMW Intelligent Personal Assistant learns routines and habits, and is subsequently able to apply them in the appropriate context. Another innovative feature of the of the all-new BMW 3 Series is the Parking Assistant’s Reversing Assistant, which helps the driver to exit parking spots or manoeuvre when space is limited. The system is able to reverse the vehicle for distances of up to 50 metres by steering it along exactly the same line it has just taken when moving forward, while all the driver has to do is operate the accelerator and brake pedals and monitor the area around the car. This system is the only one of its kind in the all-new BMW 3 Series’ segment and represents another step towards automated driving. The new BMW 2 Series Active Tourer has a long wheelbase, short overhangs and a high roofline that make it extremely roomy despite being compact in size. Road trips are also a breeze with the Page 5 of 7 car’s large doors, wide-opening tailgate, foldable passenger seat, adjustable rear seat bench and a spacious luggage compartment with a folding floor. As the world’s first premium compact model to offer up to seven seats, the new BMW 2 Series Gran Tourer fully meets the mobility expectations of young families for whom not only practicality and versatility are important selling points, but also sportiness and a leisure-oriented lifestyle. A standard third row of seats offering generous space for two additional passengers highlights the supreme flexibility of the new BMW 2 Series Gran Tourer. Its high degree of everyday practicality and flexibility is also reflected in its numerous storage compartments and spaces. The BMW 4 Series Gran Coupe is BMW’s second four-door coupe after the BVMW 6 Series Gran Coupe. The car’s dynamic-looking, elongated styling unites sedan-like functionality with the sporting elegance of a coupe. The restyled LED headlights give the car a fresh and innovative look. The BMW 4 Series Gran Coupe also features an improved suspension set-up that delivers sportier handling without any loss of ride comfort. The BMW 530e iPerformance is a sporty plug-in hybrid sedan that serves up the dynamic driving experience for which BMW is renowned, combined with the possibility of electric driving with zero local emissions. For its power source, the trailblazing BMW eDrive technology teams up with a BMW TwinPower Turbo petrol engine to create an exceptionally economical and powerful plug-in hybrid drive system with an overall system output of 252hp and combined peak torque of 420Nm. The BMW 530e iPerformance is able to reach from 0 to 100 km/h in 6.2 seconds with a top speed of 235km/h. The BMW 530e iPerformance has a range of up to 650 km in real-world driving and is capable of covering distances of up to 50 km purely on electric power at a maximum speed of 140 km/h. The high-voltage battery of the new BMW 530e iPerformance can be fully charged in under three hours when it is hooked up to the BMW i Wallbox Plus (3.7kW charging capacity). The new BMW M2 Competition replaces its predecessor, the BMW M2 Coupé which had already set the standard in its segment when it comes to agility, driving feeling, directional stability, Page 6 of 7 steering precision and controllability at the limit, without short-changing the driver in everyday use. These chassis characteristics have been further refined for the new BMW M2 Competition, and adjusted to take the increased engine performance into account by incorporating technology marvels of the BMW M3 and M4. The centrepiece of the new BMW M2 Competition is its new engine, based on the power unit from the BMW M3 and BMW M4. The double-charged six cylinder in-line engine with M TwinPower Turbo technology delivers 410hp and peak torque of 550Nm. This enables the new BMW M2 Competition to complete a standard sprint, from a standstill to 100 km/h, in mere 4.2 seconds. The new BMW M2 Competition engine compartment is also home to the most striking component - the CFRP high-precision strut from the BMW M3 and M4. This one-piece component is made from extremely light, yet high-strength, carbon fibre and weighs in at just 1.5kg. Together with the bulkhead strut from the BMW M4, it significantly increases front section rigidity to improve steering precision. With sturdy proportions, powerful presence and dynamic lines, the BMW X1 is a Sports Activity Vehicle that targets the premium compact segment. It is equipped with a highly fuel-efficient engine powered by BMW EfficientDynamics technology. Details such as the side air blades on the tailgate and the Air Curtain integrated into the air inlets at the front also boost aerodynamics and reduce fuel consumption. In terms of design, its Sports Activity Vehicle DNA is clearly reflected in its interior, significantly improved space and variability, premium ambience plus full-LED headlights and automatic tailgate operation. The first-ever BMW X2 Sports Activity Coupe cuts a sublime figure from any angle. Its stance on the road recalls a finely-tuned athlete and fuses the rugged profile typical of a BMW X model with the sporting grace of a coupe. The first-ever BMW X2 is the first model with the M Sport X model variant. Inspired by rally racing, the richly contrasting signature colour and recurring hexagonal elements form the defining visual features of the first-ever BMW X2. The dynamic handling qualities of the all-new BMW X3 Sports Activity Vehicle are rooted in its ideal 50:50 weight distribution, its meticulously honed chassis and the xDrive intelligent all-wheeldrive system. It is interlinked with the Dynamic Stability Control (DSC) which means that the torque split between all four wheels can be constantly varied to always produce the handling Page 7 of 7 characteristics for which BMW is renowned, even when the driver is accelerating. The large threedimensional kidney grille and rear lights reinforce the muscular design of the all-new BMW X3 while its interior boasts a lavish finish with Vernasca Leather sports seats and a driver-focused cockpit. The all-new BMW X4 is a Sports Activity Coupe that underscores individual character with significantly enhanced driving dynamics and a standout exterior design accentuating the car’s sporting instincts. The coupe-style roofline slides into the rear window with an elegant flourish while its dynamically stretched proportions, short overhangs and powerfully formed, subtly hexagonal wheel arches emphasise the perfectly balanced 50:50 distribution of weight between the front and rear axle. Awaiting the driver and passengers inside the all-new BMW X4 is a cabin with a modern, premium feel, whose strikingly dynamic styling also exudes an air of high-class elegance. The driver-focused layout of the cockpit helps to create a supremely assured and wonderfully sporty driving experience at all times. The ambient lighting, adding extra light sources around the centre console and instrument panel, in the door panelling and in the footwells, enhances the sense of wellbeing in the interior of the all-new BMW X4. The recipe for success of the BMW i3 has now been further improved, thanks to refreshing styling accents, cutting-edge equipment features, new digital services, and the addition of a new model variant: the BMW i3s with a higher output, model-specific chassis technology, noticeably more dynamic driving qualities and design features all of its own. It generates a particularly intense blend of the unrivalled sporty driving pleasure associated with electric cars from the BMW Group. By offering a premium-quality, all-electric driving experience, together with a whole new level of connectivity technology, the new BMW i3s represents the future of urban mobility.